After unveiling new lines twice at the Eiffel Tower, the venerable French fashion house opted to cross the Atlantic for its first-ever runway show in the Big Apple. 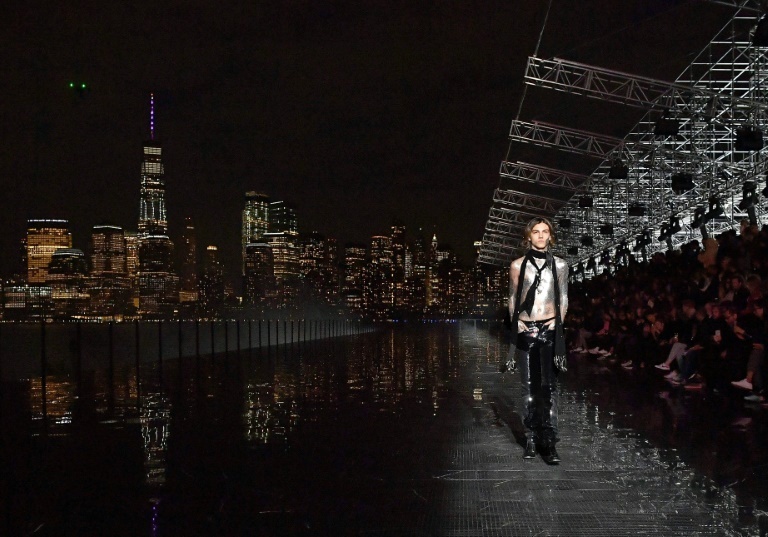 To achieve the maximum Manhattan effect, the catwalk was in New Jersey, offering a spectacular view of the New York skyline, with the Statue of Liberty nearby and the towering skyscrapers in the distance. Since taking the helm at Saint Laurent in April 2016, Vaccarello has often shown menswear and women's ready-to-wear on the same stage, but the Belgian designer split the two this time around. His decision did not in any way keep female top models -- including rising star Kaia Gerber, Cindy Crawford's daughter -- from strutting their stuff in Jersey City late Wednesday. Men and women sported dark trousers, most of them skinny pants, and black cowboy boots. 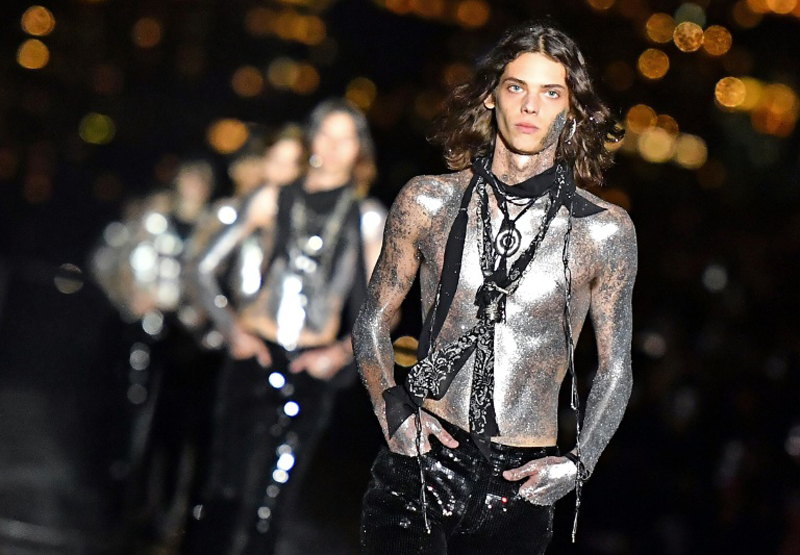 Saint Laurent's particular brand of rock chic, first minted by Hedi Slimane and now taken up by Vaccarello, called to mind the distinctive looks of music greats like the Ramones, Iggy Pop and Johnny Cash. The Belgian designer even dared to send out a group of models in nothing but trousers and boots -- and a few necklaces with a Native American flair barely covering their chiseled torsos. 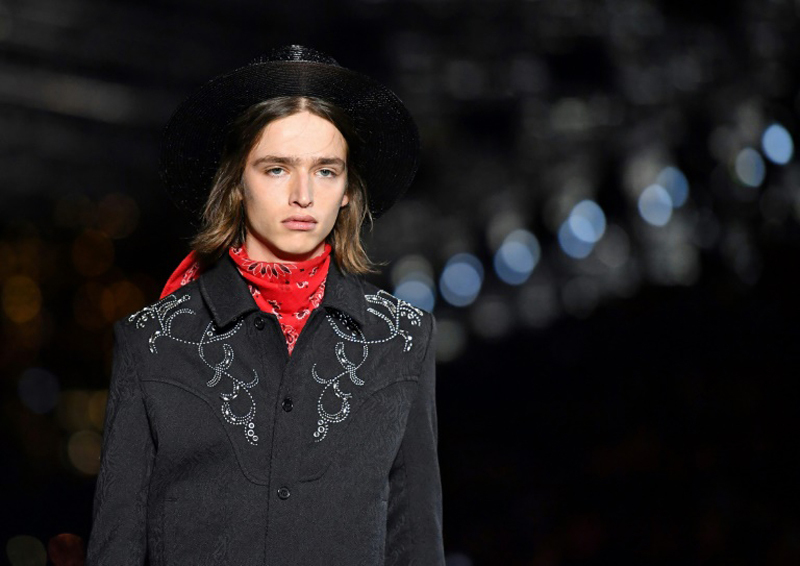 Red bandanas, metallic accents on shoulders, leather laces and wide-brimmed hats bolstered the Western look. Next spring, Vaccarello's urban cowboy will wear belted jackets embroidered with silver studs, breaking up the primarily black palette. The slim models projected a self-confident air in front of a packed crowd that included musician Sean Lennon, American actor Ezra Miller ("Justice League") and French actor Louis Garrel. Saint Laurent breathed life into the idea for a mid-season Fashion Week, following in the footsteps of New York designer Alexander Wang, who has already abandoned the traditional runway calendar. Backed by the Council of Fashion Designers of America, this initiative has so far only attracted a handful of names presenting 2019 collections. The others are still sending out "cruise" or resort collections in the gap between usual Fashion Weeks.